You may be looking for the Best Laptop for PUBG, and Cheap Laptop For PUBG, Cheapest Laptop For PUBG. If yes then stick around I have listed 5 Best Cheap Laptop For PUBG to help you out to enjoy playing PUBG in a budget. PUBG (PlayerUnknown’s Battlegrounds) is one of the most popular games of the moment and the least we can say is that it is quite demanding both in terms of skills and the requirements needed to run it on your laptop. To run PUBG on your laptop with decent framerates, there are a number of things you should consider. Before you make a list of the Best Laptops To Play PUBG, let’s first look at these settings one by one. For those who do not really like to read and would like to go straight to the point, know that you should ideally have at least one Nvidia Geforce 970M or GTX 1050 graphics card, a 1080p display, 8 GB of RAM, a high-performance processor ( I will detail below) and an SSD to be really comfortable on PUBG. To see my list of the Cheap Laptop For PUBG, scrub down. First, we need to start with the PUBG laptop requirements. And I’m not talking about the minimum requirements because, as we all know, today it does not mean anything, especially for those of us who play on laptops. I’m talking about real requirements based on experience. Let’s look at the processor first. It is quite easy to list the processors according to their performance. There is a Passmark or 3DMark reference list that displays the best processors for video games in general. Another parameter no less important for ensuring and improving gaming performance is the graphics card. Since the advent of crypto, the price of desktop graphics cards has skyrocketed. Fortunately, Nvidia’s 10-gen GPUs are good enough to handle PUBG with very high settings at 1920×1080 FHD. However, when you play Ultra, you may encounter some FPS problems depending on whether you’re using 1050, a 1060 or 1070. As for the size of the VRAM (video memory), 3 GB is an absolute minimum, 4 GB being my recommendation and 6 GB is the ideal. You can, of course, play PUBG with low/medium settings with the GTX 960M-980M, but hey, frankly it’s not foufou. Note that Nvidia GPUs are now available in two versions: Standard Pascal and Max-Q. In summary, Max-Q means that the GPU is slightly slower (~ 15%), consumes less power and produces less heat and noise. But even with this in mind, the GTX 1060 Max-Q is also capable of running PUBG just like the normal 1060. Look for the Max-Q GPUs if you want a thin gaming laptop. PlayerUnknown battlegrounds can pump a lot of memory. Not much to say at this level, you will need at least 8 GB. Having more than that is certainly a + but it is not essential. I definitely recommend getting a laptop with an SSD drive, but if you opt for a Cheap Laptop For PUBG, you may need to settle for a hard drive. PUBG will run smoothly on a hard drive, it’s just that comfort level, an SSD is at another level. Hard to go back after having tasted the delights of the SSD. If you are looking for a laptop to play PUBG everywhere, I have bad news for you. Laptops at the moment will give you at most two hours of play, no more. But if you want a laptop with a good battery life to perform other tasks such as Internet browsing or office work, you can get a decent battery life, even on a laptop initially oriented Gaming. However, gaming laptops do not offer a battery to hold a full day. It’s simply impossible with their energy-hungry components despite some well-tried attempts like Optimus’ Nvidia technology. Now that we’ve skimmed through the different parameters to take into account for PUBG, let’s get to the heart of the matter: here is my list of the Best Laptops To Play PUBG. The Acer Helios 300 is a decent option for those seeking a Cheap Laptop For PUBG with a high refresh rate screen. If you want a laptop designed specifically for games and you can not exceed 1200 euros, then Acer Predator is a great option. The Helios model comes with the popular i7-7700HQ and a mid-range GPU 1060 GPU that will average 67 FPS on average settings. It also comes with an IPS panel for better viewing angles and color contrast. The set is supported by 16GB of DDR4-2400 ram and an Intel 600P SSD. The machine weighs 2,876 kg for the machine tested. The record is quite satisfactory. Noted 82%, this 17 inches. The performance is largely sufficient for a full HD screen and Best Laptops To Play PUBG the laptop looks both thin and solid. The Acer Predator Helios also has an empty 2.5 “hard drive slot for an SSD or SATA hard drive. However, as such machines go, it isn’t too outlandish. Much of the laptop is finished in either matte black plastic or a brushed black anodized aluminum that looks reasonably smart. Slap a sticker over the Predator logo on the lid and it could just about pass for a more business-like machine. This is far from the slimmest or lightest 15.6in laptop there’s ever been. The bezels around the screen are noticeably wide, making for a hefty footprint of 390 x 266mm. The Helios 300 is also relatively chunky, at 26.8mm thick and weighing 2.7kg – 500g or so more than the lightest 15.6in gaming laptops. That said, compared to other budget gaming laptops, these specs are typical. The Helios 300’s keyboard is decent. It offers a proper UK layout, with all keys clearly labeled and minimal bunching. Connectivity provides the essential but the tester would have preferred that the vacant space left by the optical drive hosts more interfaces. There are four USB ports, two of which are still limited by the 2.0 standard and USB Type-C without Thunderbolt 3 support, an HDMI output, a Gigabit Ethernet port and an SD card reader. Their distribution is good. Built around a Quad Core i5 Coffee Lake, 8 GB of RAM and a 1.1 TB hybrid storage, the model tested behaves perfectly in this configuration and occupies the first places in all the “benchs” office automation /job. This latest generation processor makes it possible to supplant a Quad Core i7 Kaby Lake from 5 to 10%, enough to cover all current tasks and other greedy missions such as video editing or 3D. The system fluidity is good even if the SSD is not the fastest in the market. The graphics part is entrusted to a GeForce GTX 1050 Ti latest generation Pascal designed for casual to demanding players. It is very well exploited here and can deploy its full potential, Best Laptop for PUBG to play in Full HD-High / Ultra on most recent titles. In addition to its attractive price, the Acer Predator Helios 300 PH317-52 also offers exceptional battery life. It takes 100 minutes in full charge and up to 12 hours in standby (minimum brightness). In Web browsing with active WiFi, it easily reaches 6 hours although its battery 48 Wh is especially great. The Asus ROG G502VS is the most powerful laptop on this list. 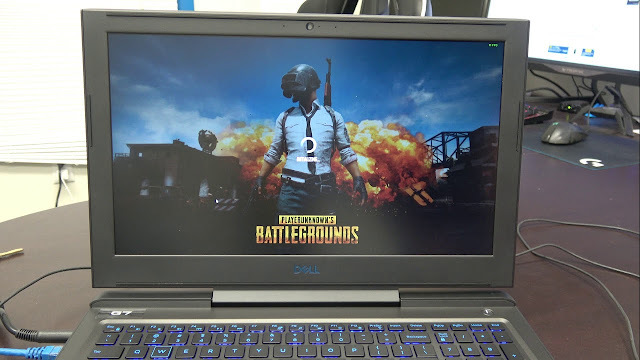 whether you looking for Best Laptop for PUBG, Best Laptops To Play PUBG or Cheap Laptop For PUBG, First, it features the Nvidia GeForce GTX 1070 graphics chip and the latest i7-8750H processor. This should result in an average of 105 FPS on average parameters. In addition to good performance, it is much lighter than the Acer Predator above. You might think that this would result in a high temperature and therefore heating of the pc but that nay! Asus has achieved a real feat of engineering because there are really very few complaints about heating on this model. Asus uses 3 fans and a modified fan housing design to reduce dust accumulation, so the system does not need regular cleaning like most other gaming laptops. In addition, it has a high refresh rate panel with an IPS screen. Unfortunately, it suffers from problems common to gaming laptops – reduced battery life and displays with average brightness and contrast. Designed for a premium kennel, the Asus ROG GL502VS sports a neat, solid and reliable design. The chassis is relatively compact with a weight of 2.6 kg and an average thickness of 30 mm but does not really differ from its predecessor. The aluminum lid is always covered with a brushed effect with the orange backlit logo surrounded by two strips of the same color. The hinges appear stable and require only one hand for opening the lid. Under the machine, the base is plastic and does not present any hatch of now. Fortunately, the hood retires without forcing and without hidden screws. The regret is the inner side which is also made of plastic, with an imitation of brushed aluminum. If this material can isolate more heat, the visual result may leave some on the key. Built around a Quad Core i7 Skylake, 8GB RAM and 256GB SSD hybrid storage, the PC hovers over common tasks (web browsing, Office suite, video playback) to work on missions more demanding like video editing or 3D modeling. Multitasking will be easy too, even if the fluidity is somewhat tainted by the SSD M.2 SATA, much slower than the SSD NVMe crossed in other configurations (a detail to check before purchase). The graphics processing is entrusted to the GeForce GTX 1070, the second most powerful graphics card placed in a laptop (after the GTX 1080). This card offers very solid graphics dimensions, supporting all the titles in vogue in Full HD with high levels of detail (Ultra) but also the game in 4K, with great fluidity. With a relatively thin chassis, the Asus ROG GL502VS fans have to work hard to maintain proper temperatures. This is why they are clearly heard in intensive use. Nevertheless, they remain relatively discreet in light use and manage to preserve performance. The battery may be sufficient (64 Whr), the presence of the G-Sync (HD 530 chip disabled) is not in favor of endurance. Barely 3 hours and 45 minutes have been reached in Internet browsing with active WiFi, it is very average. Also, it is rather expensive and it is the case to say it! If you want a mix of performance and affordability, this is the side of Lenovo Cheap Laptop For PUBG you need to look for. Compared to the model presented above, it is certainly less powerful but it still remains a small race with its core i7-7700 HQ and Nvidia 1060 and 6 GB of VRAM and its autonomy of 6 hours of navigation on the Web. With this laptop, you can expect an average of 76 FPS. It is really powerful and is offered at a great price considering the embedded components. If you are looking for the Best Laptop To Play PUBG with the best value, this is it. Outdoors, the Legion Y520-15IKBN looks almost like any versatile notebook as its black shell remains sober. We find a finish carbon fiber way and some reliefs here and there but no touch of red indicates that we are facing a PC gamer. In fact, a typical user can very well be seduced by this PC. At the opening of the screen, the DNA game is a little more with the keyboard, the outline of the touchpad and the logo Legion red, but it is still the order of the discreet. Overall, the assembly is well made and the plastic shell resists pressure, especially at the base (no image distortion on the lid). Also, note that the hinge lifts the screen with one hand while holding it firmly (opening up to 150 degrees) and the PC is mounted on thick rubber feet to ensure stability. Finally, the tester regrets that the hull hangs fingerprints at this point. The weight of the PC is average, neither really light and thin nor too corpulent. If the tester is not very fan of the size of certain keys and the arrangement of the numeric keypad, the keyboard still makes a good impression. The keys are soft with sufficient stroke and resistance and the space around the directional arrows is welcome for the players. The keyboard is backlit in red on two shades. For its part, the touchpad comes out both visually and physically through a trapezoidal effect that reduces the lower surface and therefore hinders the consideration of movement. Mouse clicks are independent of the pad but are still linked together, forcing you to press the outer edges of each button for proper support. Compared to older PC gamers from Lenovo, the Legion Y520 makes a big leap forward by incorporating a full HD IPS (1920 x 1080 px) panel at wide viewing angles. However, its contrast and brightness levels (260 nits max.) Remain average, as is the colorimetry with an sRGB space covered at 65% and a Delta E around 4. The model tested has one of the most basic configurations, consisting of a Kaby Lake Quad Core i5, 8 GB of RAM and storage by the hard disk. This base, however, offers a good answer for all the versatile tasks (common tasks, video editing, a little 3D). To know that an M.2 SATA slot is free and accessible without much difficulty after dismantling the lower hull (no maintenance hatch). The GeForce GTX 1050 ensures a correct level of play and launches all titles in the market in Full HD with good playability (about 50 fps / Ultra). Configurations with a GTX 1050 Ti obviously gain in game quality. On this Lenovo Legion Y520, the fans are running almost continuously. However, they remain discreet enough when the use is light and are even exceeded by the scratching of the hard drive. Of course, the noise gets louder when you put the PC to the test but the record remains average. For this configuration, temperatures are well dissipated and do not affect performance. The Lenovo Y520-15IKBN incorporates one of the smallest batteries in its class (45WHr). In fact, autonomy should not exceed 3 hours in Internet browsing with active WiFi. The charge takes approximately 2 hours. The connection is generous and provides three USB ports including two USB 3.0, a USB Type-C (Gen1, no support TB3), an HDMI output, an SD card reader and an Ethernet port. The tester draws your attention to positioning the USB and HDMI ports on the right edge, which may interfere with the handling of an external mouse if you connect a lot of peripherals to it. The Acer AN515 is the cheapest laptop to play PUBG. With this laptop, you can expect to achieve an average of 46 FPS with average settings at a resolution of 1920 × 1080. Of course, during a game, the fps could fall to about 40 but it’s still playable. And you can always reduce your settings to a low / very low preset if you want higher framerates. Acer released in the hexagon its Nitro 5 AN515-42-R5QA, new laptop 15-inch IPS Full HD screen anti-glare games-oriented which is currently displayed on sale flash for 889 euros on Windows 10. It has a Quad Core processor Ryzen 7 low power consumption, a good amount of RAM, a large capacity hard disk, a dedicated AMD Polaris 4GB dedicated graphics card, a USB 3.1 Type-C connection or a backlit chiclet keyboard. The Acer Nitro 5 AN515-42-R5QA targets those who want to acquire a 15-inch high-definition, gaming-oriented, high-definition laptop. It is indeed equipped with the dedicated card Radeon RX 560X AMD Polaris version 4 GB dedicated to run many games as long as you consent to the settings under titles greedy graphics resources to get good playability. Of course, no worries to look at photos and videos on this laptop whose screen adopts specifications lend themselves to this use. It adopts indeed a 16 / 9th format, a definition Full HD ideal to display High Definition content or technology IPS. It reproduces the colors more faithfully than average and provides important viewing angles, both horizontally and vertically. This computer is based on a low-power Quad-Core Ryzen 7 2700U APU (Accelerated Processing Unit) processor (equivalent to a Kaby Lake Refresh Quad Core) and 8GB of RAM which is a good fit for the RX 560X in gaming. Connectivity side, this portable end is well equipped with its wireless modules and Bluetooth 5.0 Wi-Fi ac to communicate and connect remotely, its audio and Ethernet ports, its convenient HDMI video output to easily connect to a monitor or a TV for example, its USB 3.1 Type-C as well as its 3 USB all compatible with both USB 2.0 and USB 3.0, USB 3.0 guaranteeing transfers up to 10 times faster than USB 2.0 if USB 3.0 devices are plugged into it. Finally, the keyboard chiclet has a system of backlighting keys convenient to distinguish them correctly in dim light. This is one of the cheapest laptops with an i5-7300HQ processor which is the most popular proco of the latest generation i5 notebooks. No SSD to save the most money. For storage, there is a 1 TB hard drive. The main disadvantages of this laptop are its low battery life and its somewhat faded display. 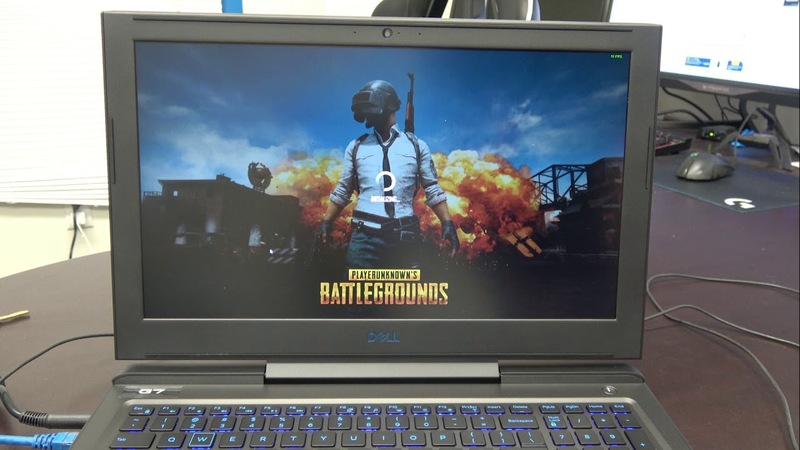 Dell’s new Inspiron series, the G5 is a laptop perfectly suited to PUBG. With its 16 GB Ram, its 8th gen i7 processor and GPU 1060 with 6 GB of VRAM, the least we can say is that it has under the hood. Beyond the power, it is a particularly well-finished laptop, with an aesthetic really pleasing to the eye. A new versatile, high-performance, game-oriented notebook, the Dell Inspiron G5 5000 comes in a version worth less than 900 euros. It runs on Windows 10 with a dedicated NVIDIA Pascal GTX Ti graphics card with Optimus technology, a latest-generation Coffee Lake Quad Core i5 processor, a dedicated SSD storage solution, a 15-inch Full HD IPS matte screen, Thunderbolt 3 connectors or even more. a backlit chiclet keyboard. It has a sober look for a portable gamer with its black finish and angular lines, the heat being removed by the wide rear grille. Dell says that you only need to remove one screw to access the system and its components. It is possible to recharge the battery at 25% in 15 minutes. This Dell Inspiron G5 5000 is a versatile high-performance 15-inch High Definition portable gaming-oriented notebook. It is able to run a maximum of games thanks to its dedicated Geforce GTX 1050 Ti 4GB dedicated card, and this if we proceed to settings under the titles greediest graphic resources. The NVIDIA Optimus embedded technology automatically activates/deactivates the Geforce GTX 1050 Ti in real time, according to your needs. In order to favor autonomy, Optimus prefers the Intel UHD 630 processor to its maximum despite its modest performance because it is energy efficient. Of course with these two graphics solutions, it is possible to watch photos and videos. With its 16 / 9th format, the screen lends itself well to playing videos, especially since it adopts a parallel Full HD definition. IPS, the screen also offers a more accurate colorimetry than the average and very comfortable viewing angles, both horizontally and vertically. Anti-reflective, the screen also provides better visibility than a bright slab in a bright environment. This notebook stands out with its latest generation Coffee Lake Quad Core i5-8300H processor. Coupled with 8 GB of RAM, it delivers strong overall performance to satisfy a maximum of users. This duo guarantees everyday operation much faster than a Dual Core processor (or quad-core low power) and 4 GB DDR3 / 4, the difference is particularly noticeable under the demanding work in CPU and RAM resources taking advantage of the architecture multicore. Dedicated SSD storage helps make this computer significantly more responsive and fluid to use (including in games) than if you were dealing with a hard drive. Compared to the latter, an SSD is indeed much faster but also less energy, more robust and quiet. However, the 256GB capacity of SSD is lower than standard hard drives, which is often the case. A 2.5-inch slot is normally available, which allows you to add a hard disk (or a second SSD). In any case, one can obviously use an external storage unit as a USB 3.0 device. This will benefit from transfers made up to 10 times faster than USB 2.0. Good onboard connectivity, includes just 3 USB 2.0 compatible USB, 1 USB 3.1 Type-C Thunderbolt 3, Bluetooth 5.0 wireless modules and Wi-Fi ac to communicate and connect remotely, audio ports and Ethernet or a convenient HDMI video output to easily connect this PC to a TV for example.